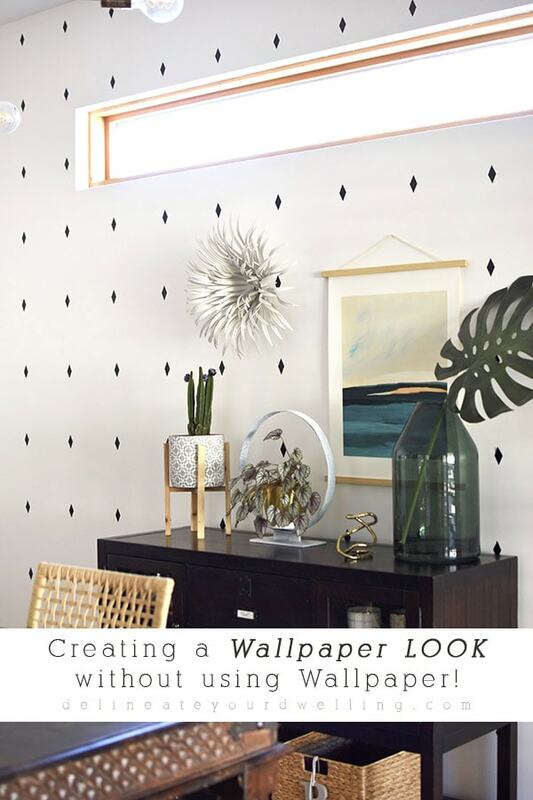 INSIDE : How to easily create a Wallpaper look without using Wallpaper! 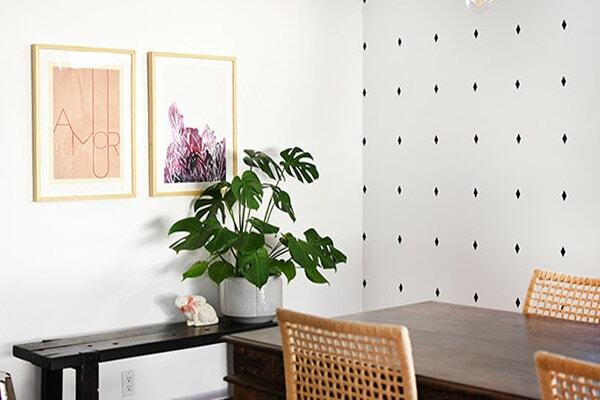 Check out how to make quick decals for an inexpensive professional accent wall look. 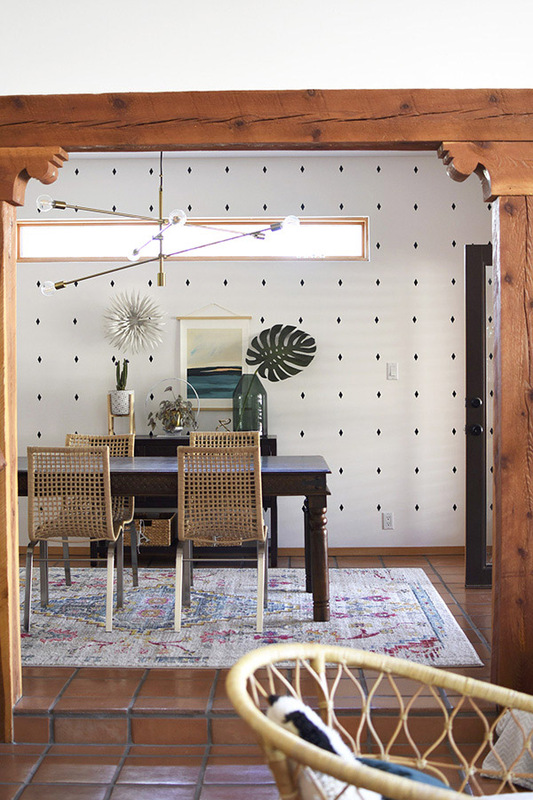 If you have been following along the last few weeks, I finally shared my Modern Southwest Dining Room update post. 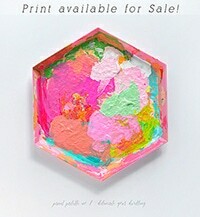 And then I talked about how to Mix and Match your artwork. 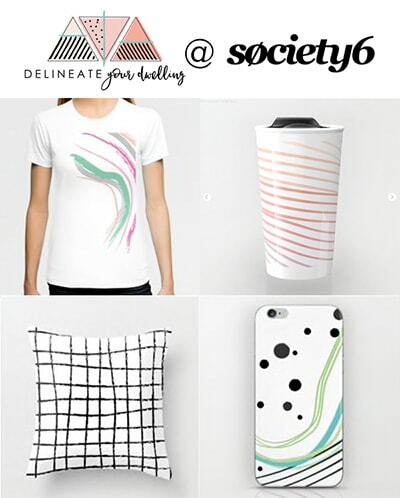 Well, today I am sharing about the much anticipated wall treatment, how to create a Wallpaper look without using Wallpaper! I LOVE easy projects and this is an easy easy wall treatment project. I ran out of a supply halfway through the install or it would have only taken one single day to do this main statement wall. This project could be done a handful of different simple ways. 1. 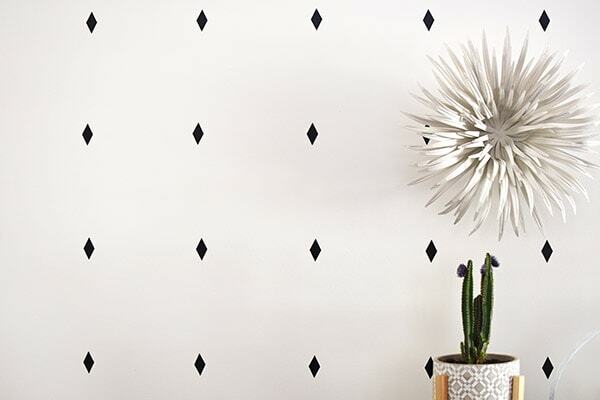 You could create a diamond stencil and paint small black diamonds on your wall. 2. You could also cut vinyl diamonds out using scissors. 3. HOWEVER, I already owned a Silhouette Printer and I was looking for a very clean and precise diamond, so I decided to go that route. First, using my Silhouette software, I created this easy diamond shape and then loaded this Premium Black vinyl into my printer. NOTE : We have smooth, no texture walls in this room. Also, I had just painted the walls an eggshell finish. I had originally tried using a gold vinyl that I had sitting around, but it wouldn’t stay stuck on the walls. I think using the Premium black vinyl was the key. This has been on my walls for two months and not one single diamond has peeled up. Also to mention, I can remove these decals without much issue at all and there is absolutely no damage to the walls. I started against the far left wall, and started marking off 8″ across the entire room. I was sure to use my 36″ wall level to keep the rows perfectly straight. 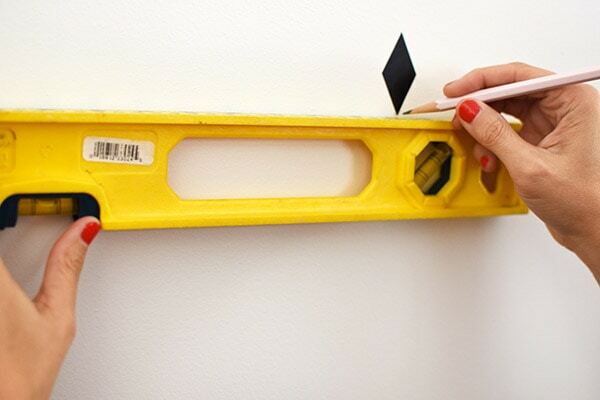 Once I had my first row marked on the wall, I then measured up 10″ using my level. My diamonds were 2″ in height, so this ensured that my diamond decal pattern was 8″ on center in each direction. Once the marks were up, adding the decals was a breeze. Every so often I would print and cut out another 8.5 x 11″ sheets of black diamonds. To keep the pattern less busy, I decided to apply the diamond decals to just the main large wall in the room using it as an accent wall. Also this is the wall you can most easily see from multiple other rooms in the house. I have long wanted to add wallpaper to our home, but after feeling so overwhelmed with having to select just one pattern and then not wanting to go to all the trouble of installing and eventually removing the wallpaper… I could not be more pleased with my Diamond Decal wall! It will be such a breeze to remove when the time comes. It looks really gorgeous. And so simple to make! Awesome idea. I have been waiting for this!!! So so awesome, Ames. Perfectly executed. The first time I saw a photo of this wall I thought, No! She did not put up wallpaper?!?! And then I thought, no, it’s got to be something way more awesome than that. And I was right. Well done. It’s beautiful!! The scale of it is just right too. You are too sweet, Meg! I WISH it was wallpaper… but honestly these vinyl decals took a day total – so worth it, in my mind!